I have some apologising to do. First, apologies for the long silence. Second, apologies for this post, which is probably going to be rambling and pointless and not terribly interesting, and possibly misspelled because the T on my keyboard is playing up. I was away without internet access for a week, so I couldn't post, but somehow after that I didn't manage to get a post out and all of a sudden it had been over a week since I meant to get back to blogging. I've been shamefully unproductive since the start of the summer holidays: I got my edited draft finished before than, but since I've done little more than toy with a few ideas for revisions, and I've sadly neglected both this blog and my twitter feed, although I really need to be working on building a platform. I think I'm supposed to have a website as well, and to have worked out how to use Triberr and MYWANA and all of that sort of stuff. I'm also no further forward with titles, and every time I think I've made a decision about publishing, I hear something else that makes me reconsider, or it turns out that the decision has sired a litter of smaller decisions that all need to be considered and weighed up and finally, painfully, made. Finally decided to definitely self-publish, probably? Fine, now will it be in your own name, or that of a press you will start up? And how exactly does one go about starting up an independent press to publish one's books? Getting a draft finished, getting through a round of revisions and actually giving the wretched thing to some people to read felt so huge, so very much as though I was nearly there, but now I think I'm sort of lost. I've also been intending, for a month or two, to rebrand this blog. I was never quite happy with the name - which my brother thought up and talked me into, and which I've steadily alternated between loving and loathing ever since. But however good it was or wasn't for a blog about life, the universe, and everything, the pun is sort of lost on a writing blog. And then the whole thing was started when I didn't know what I was doing, and hasn't been properly sorted out since. Hopefully, this week or maybe next, I'll finally get around to doing it. I'm being good now: today I finally started rewriting my opening scene, the only significant change I've decided on yet for my second round of editing. And I recently had an unexpected windfall which ought to take at least a good chunk out of the stuff that costs actual money, like professional editing and websites. And in less than a month I will be an actual published author! Well, a bit. Remember this? 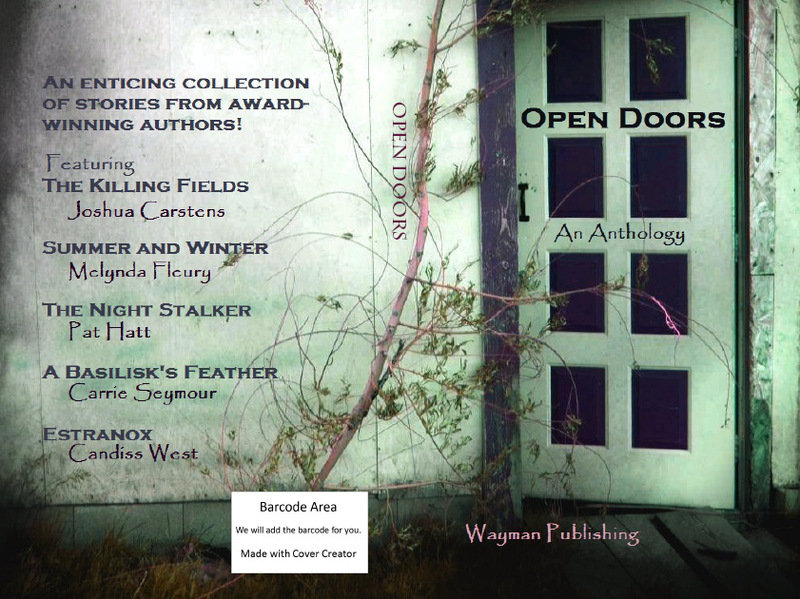 Well, I may have said around the time, but it did get entered into the contest (Eliza, lovely person, said she wanted to make an exception about the length), and it came fourth, and is being published in Open Doors, an anthology by Wayman Publishing, on the fourth of September. Award winning authors! 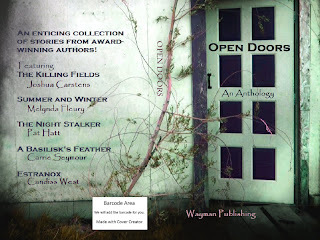 And my name in the list, under the title of a story that I wrote that is getting actually published in an actual book. I must have looked at that picture a hundred times, or nearly, and I can hardly describe the feeling I still get every time I see it. Like a balloon in my chest. I think when I see the actual book I might physically burst. I hope to either get my rebranding done, or get one or two more posts out over the next week, or maybe even both if I manage to be unprecedentedly productive, but for now, I'll just finish by talking about what I did on my holidays. We went to Snowdonia. That's in North Wales, and even without the summer we'd had in Britain up to that point (must have been pretty near to forty days and forty nights of rain) you would not expect fine weather every day in North Wales. We couldn't have ordered better weather. Well, that's not quite true; if I had, I'd have had it a bit cooler on the Tuesday. That's the day we climbed Snowdon (I climbed a mountain! An actual proper high peak) and I got sunburn. In North Wales. And sweated what must have been literally buckets, or at least one smallish one. But we didn't once walk in the rain, and after two days of lugging unworn sweatshirts about we all got the message and set off every day in t-shirts. And as well as good luck with the weather we had the best luck at the end of the walk up Snowdon. We started a mile and a half downhill from the carpark where the Pyg Trail begins - the carpark was full. On the way down, I waited with Mum while Dad and Nick went down to fetch the car. There's a shop and a cafe there, and as we were waiting the manager came out with a bag full of pasties, unsold, and gave them to the half-dozen late walkers doing the same as us. we got two Cornish pasties, something I'd never tried before, between the four of us, and just at that moment the others drove up. I'm sure that half of a pasty was nice anyway, but after the long, steep walk, it was beyond description. The last day had the best weather of all: sunny, dry, and the most beautiful temperature for walking in. Just cool enough to make you consider wanting to put a jumper on when you were standing still, and absolutely perfect when you weren't. And the most lovely walk too. I'll tell you a secret here, for if you ever visit Snowdonia yourself. If possible, find yourself a beautiful sunny, slightly warm afternoon - but you might have to make do with what you can find. Start climbing Snowdon, by the Watkin path. Don't worry about it being late: you're not going all the way up. Turn right, off the Watkin path - following a sign that says waterfalls, if I remember right - and follow a little path down to a small river. You'll know if you're in the right place, because there's a fantastic stone bridge, a long flat slab laid across the river, but a couple of feet too short. A second, shorter slab bridges the gap, and the join is supported by an ingenious layout of uprights and buttresses, all drystone and looking as flimsy as nothing you'd like to walk across but all steady as bedrock. Cross the bridge, turn left, and follow the river up to where the path ends, a little way before some old ruined buildings at the water's edge. The river is beautiful, waterfalls all the way down, rocks smoothed and scooped out by the rushing water, the deep pools under each fall layered with round pebbles, and the minerals in the rock (copper, I believe) give the pools the most beautiful blue-green colour of any tropical lagoon. At the top, there's a little sandy patch, just a few yards downstream of a tiny island adorned with a rowan tree and an array of grasses to equal anything carefully planted and tended by a devoted gardener. Resist, for a moment, the urge to look down the valley, and stand on that patch of sand and look upstream, with the island in the foreground and the tumbling river cutting through your picture, a great V of mountains for a frame. There's a lone tree standing up off the skyline of the right-hand mountain. The old buildings don't seem to spoil it, rather the contrary, I think. The scene is at once grand, rugged, and desolate, and pretty and cheerful. If I had arranged it all I think it would have fallen far short. I've never seen a view to match it.